If anyone is following the race for the democratic nomination for president, one topic that gets discussed ad nauseum is whether Barack Obama or Hillary Clinton has a better chance of winning against McCain in the fall. The problem with such arguments is that there are different roads to victory and and the two candidates are strong in different parts of the country and weak in different parts of the country. *All calculations based on the most recent poll in each state, and using date pulled from a site I highly recommend Electoral Vote. 3. The margin of error on most polls in 3-5% so the lightest blue and lightest green states are ones where neither candidate has a significant advantage. 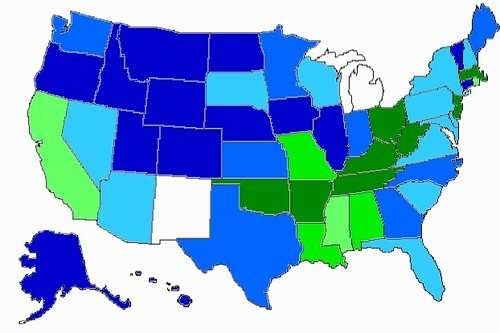 If I did this map again in a week, after new polls had come out, a lot of those states might change colors.